One of the things you do when you have a convertible car is to debate whether to leave it locked or not. I have a Jeep, although this one is not mine. The roof is basically vinyl held together with marine thread and the windows are a thick clear plastic that is now scratched over 8 years of use. I call it Saran Wrap and Velcro. Not meant to do more than keep the rain or the sun off of you, it's not the most secure vehicle on the planet. I will tell you that they're a blast to drive. This is my third. I used to keep a fabric Gecko on the dash, made with a filling of little metal balls, it held things in place as I bounced through the open air. For the most part, the safest way to keep your "open car" is with an alarm set, nothing in it you wouldn't mind losing, glove box open, and the doors unlocked. Let them get in, look around, realize it's a waste of time, and they move on. When I lived in Philadelphia, people slashed my windows to get at what wasn't in the car after the alarm went off. Having "more than some" graphics arts skills, I made up a sign that looked like a child wrote it on the computer that said "No Money in Car and No Radio in Car" with a picture of the car next to it. It never got molested again. Luckily here, right in the heart of Wilton Manors, things are for the most part safe. 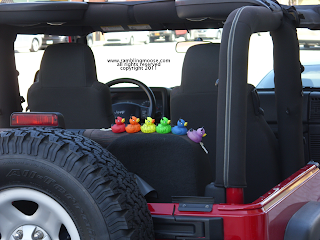 This particular person with their Devil Ducks had their Jeep completely open for the span of the afternoon. I should know, I walked past it twice. It's the Security By Obscurity mindset. Let them think nothing is there and you won't be bothered. Hide things in plain sight. Oh and my particular Jeep? I have a stereo in it, but every time I leave that face plate is in my pocket with all the rest of the crap I bring with me. Right now in the driveway, it sits with literally nothing but dirt in the ashtrays since I do not smoke. Usually I disable the car so that it can not be started since I never drive the thing. There's this one engine Master Fuse that I can pop off the housing and I'm safe.. its just a big planter made in Toledo.